Doing a fan art based off one of my ALL TIME FAVOURITE artists Skottieyoung. I saw his Spiderman image and was blown away. I dug it so much that I decided I had to try and do him in 3D......just for fun. See what I mean? I dig it.......hard! It has been such a pleasure trying to re create this guy in 3D. A huge thanks again goes out to skottieyoung for the inspiration, not only for this piece but also just for being an all round rad artist. Thanks to all of you guys and girls also. All of your positive feedback and comments have really made this one of my most enjoyable arts. Not only is this awesome but for some reason it reminds me of Jack Skellington. I had np idea this was in 3D till i looked at the description. talk about a daddy long leg spider lol nice work. all right, who gave Jack Skellington the Spider-Man costume? It came out great! Congratulations!! has a nightmare-before-christmas ring to it. it's a great picture! 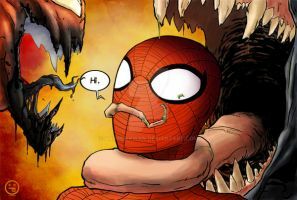 Thismakes me think and im sure many others as well,"What would Spider-Man look like if Tim Burton made his movies?" I love this btw,Very Very Cool and it made me smile in a time that smiles are few for me so Thank You! Would you like to purchase my domain, www.Spideyman.com ? If so, I'd be happy to answer any questions. Man, first Jack Skellington poses as Santa, now he's trying to take Spidey's spot as well, huh? Love your style, mr, Fraser. This looks like Slender man is going out for Halloween. Great work! It reminds me of Tim Burton even more than the original. reminds me of tim burtons character style. came out nice. I was just about to say that, but you beat me to it! There are few who would deny that what he does he is the best. His talents are renowned far and wide. He excels without ever even trying. THIS is how Spidey should look like!! Nightmare Before Christmas meets Spiderman! I love it, it's very tim-burtonesque. Now THIS is a movie I would watch. Cool man, very Tim Burton style! 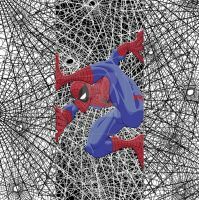 This is a pretty cool rendition of Spidey. Well done!